When the Scots immigrated to Canada, many brought their language with them. 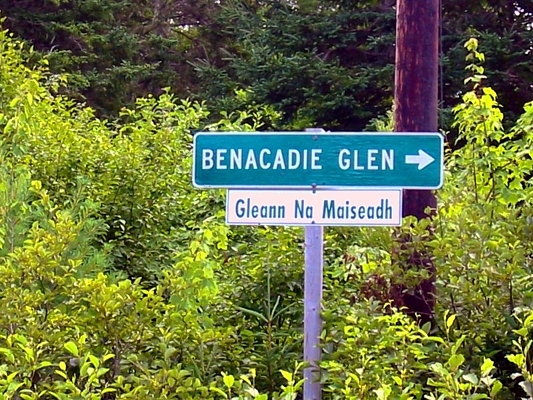 Canadian Gaelic is a French- and First Nations- influenced dialect of Scottish Gaelic that has been spoken continuously for more than two centuries on Cape Breton Island and in isolated enclaves of the Nova Scotia mainland. The language is also spoken to a lesser extent on Prince Edward Island. Due to the high number of Highland immigrants that flocked to Canada in the nineteenth century, Gaelic peaked in 1850 as the third most-commonly spoken language in Canada after English and French, believed to have been spoken by more than 200,000 British North Americans. In PEI and Cape Breton, there were even large areas of Gaelic monolinguism, and Gaelic-speaking communities had established themselves in Nova Scotia, Ontario (Grey, Bruce, Glengarry, and Stormont Counties), Eastern Quebec, and Winnipeg. 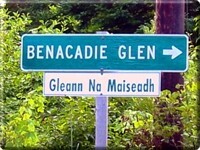 Gaelic also influenced Cape Breton English to a considerable degree. Sydney, Nova Scotia, was also home to the world's longest-running Gaelic periodical: edited by Cape Breton-born Jonathan MacKinnon, Mac Talla ("Echo") circulated for eleven years from 1892 to 1904. Gaelic was, in fact, the most common mother-tongue among the Fathers of Confederation. 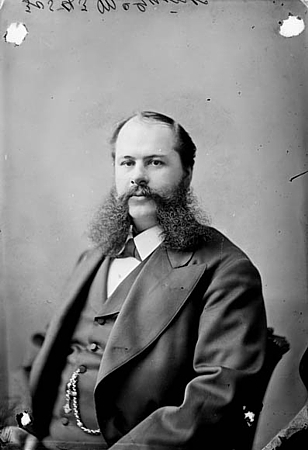 In 1890, Thomas Robert McInnes, a Cape Breton-born independent Senator from British Columbia tabled a bill entitled "An Act to Provide for the Use of Gaelic in Official Proceedings." He cited the ten Scottish and eight Irish senators who spoke Gaelic, and thirty-two members of the House of Commons who spoke either Scots- or Irish Gaelic. Although the bill was defeated 42-7, the attention it merited speaks volumes in regard to the influence the Scottish community wielded in the Canadian government. Despite the long history of Gaelic in Canada, the fluent population started to decline after 1850 as Gaelic-speakers began to assimilate more thoroughly into the larger framework of Canadian society. The fact that Gaelic had not received official status in its homeland also made it easier for Canadian legislators to disregard the concerns of domestic Gaelic-speakers. The language also faced prejudices, as it was derided for being primitive and inferior to English. 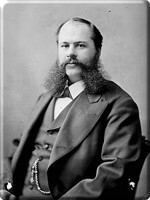 In response to McInnes's Gaelic bill, for example, Lunenburg Senator Henry Kaulbach described the language as being something only "well suited to poetry and fairy tales." As Atlantic Canada entered the twentieth century, job opportunities available to monolingual Gaels dwindled. Compelled into the mines or the fishery, they began to view English fluency as the key to economic success and had no institutional support for their language. Gaelic fluency plummeted as Gaelic-speaking families adopted English as the language used in the home. The societal structure that organically supported the transmission of the language, and its associated (mainly oral) traditions, thus collapsed. As a result, the Gaelic-speaking population halved during the second part of the nineteenth century, plunging from its 1850 peak of 250,000 to just 80,000 in 1900. By 1930, that number had shrunken to 30,000. Today, only 500 to 1,000 native Gaelic speakers remain in Nova Scotia, and most of them are elderly. Traces of the language are still commonplace, however, on Cape Breton's traditional strongholds like Christmas Island, the North Shore, and Baddeck. Ontario's last native Gaelic speaker, Alec McDonald, a descendant of the original Glengarry pioneers, passed away at the age of 96 in 2001. Gaelic's increasingly desperate situation led A. W. R. MacKenzie to found a school in St. Ann's on Cape Breton Island in 1938, a school devoted to the study and preservation of the language and Celtic arts and culture. In parallel to the Scottish Gaelic revival on the opposite side of the Atlantic, Canadian Gaelic enjoyed a re-emergence in the 1990s. The Nova Scotia Gaelic College, for example, has since expanded and earned "an international reputation for its contribution to the maintenance and preservation of the language and culture," with students of all ages from all over the world going there to study Scottish language, song, music, dance, and crafts. Several government initiatives have also been undertaken to assess the current state of the language and language-community. 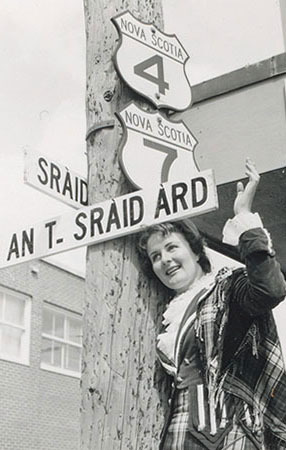 In 2002, the Government of Nova Scotia commissioned a study on the economic impact of Gaelic culture, which concluded that the 380,000 tourists who attend the province's 2,070 annual Celtic cultural events generate over $23.5 million annually in direct revenue for the province. 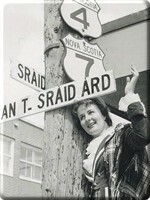 Based on these findings and others, the government, in conjunction with the Nova Scotia Gaelic community, founded the charitable Comhairle na Gaidhlig (the Gaelic Council Nova Scotia) to develop the Gaelic community, strengthen Gaelic education, legislate bilingual road signs and publications, and to build ties with other "heritage language" communities (the Mi'kmaq and Acadian French) and with Scotland. Building off of the Gaelic community's enthusiastic response to such efforts, the Government of Nova Scotia created the Oifis Iomairtean na Gàidhlig, or Office of Gaelic Affairs, in 2006 to assist in the promotion and development of Gaelic language and culture in the province. That same year saw the establishment of the Halifax-based Atlantic Gaelic Academy, which teaches the language through in-person and live distance-learning classes throughout North America. The Academy offers a standard three-year program consisting of Beginning, Intermediate, and Advanced levels, and currently boasts the largest number of Gaelic students of any organization in North America. Today, over a dozen public high schools across the province offer Gaelic courses as the language enjoys increasing popularity. While Gaelic can also be studied at colleges and universities throughout Nova Scotia and elsewhere in Canada, the Celtic Studies Department of St. Francis Xavier University in Antigonish is one of only a few universities outside of Scotland to offer four full years of Scottish Gaelic instruction at the undergraduate level.